An op-ed piece by former UK foreign affairs secretary Jack Straw reveals on how high-level Western statesmen think about international affairs and the Middle East. Before beginning I want to make clear that my problem with Straw’s analysis is not his opposition to a military attack on Iran. Actually, I agree with him on this point. The problem is his reasoning on the framework around that point. I don’t know if he is responsible for the title of the article in the Daily Telegraph but it does reflect the dangerous worldview of Western leaders. It is, “Even if Iran gets the Bomb, it won’t be worth going to war.” This is rather open-ended. The title might better have been: Going to War is Not the Best Response to Iran’s Nuclear Weapons’ Drive. The trouble with the actual title is it basically implies that no matter what Iran does once it gets the bomb it won’t be worth the West going to war. And that is really what Straw is saying. Straw’s first point is that he objects to the statement that “all options remain on the table” regarding Iran’s campaign. In other words, the West should drop this, making clear that no matter what Iran does the West won’t resort to force. He is thus advocating throwing out a prime aspect of Western leverage. How does he justify this? Basically by saying that Iranians are proud and patriotic and thus resent such threats. Straw says they would be more flexible if they are assured that the West won’t attack. While I oppose an attack, it is absurd to remove a prime incentive for an Iranian regime to make concessions or—as is far more likely since Tehran wants the bomb—to be more cautious. By removing this threat, the West would undercut those members of the Islamic Republic’s elite who—no matter how radical they are—warn that seeking nuclear weapons is too risky. Certainly, Obama has rejected taking any such step, verbally asserting the continuing possibility of a military response at some point. Yet this is a common theme of contemporary Western diplomacy–including Obama’s behavior toward radical Islamism generally–assure your actual or potential foe that you won’t do anything nasty to them and then expect them to moderate. This isn’t how Middle East thinking or politics works. –“If Iran were to attack Israel” or an Arab state, the victim has the right to retaliate. But, ahem, the whole purpose of policy toward Iran is to make such an attack impossible, to ensure they don’t become victim to mushroom clouds that kill hundreds of thousands of people. Straw is actually saying: No worries! 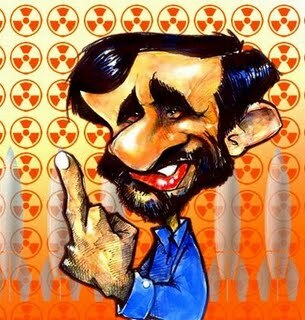 If Iran drops nuclear warheads on Israel or Saudi Arabia they have the right under international law to retaliate! –“But such an attack is highly improbable.” It isn’t clear to me whether he is saying that Iran won’t attack them—how about some serious argumentation to try to prove that—or whether they wouldn’t be able to retaliate. I think that an Iranian nuclear attack is unlikely but it could happen and one cannot just assume that it won’t. After all, a Soviet nuclear attack on America during the Cold War was far more unlikely but the United States and its allies spent huge amounts to create hundreds of warheads along with geopolitical efforts to prevent the USSR from ever thinking it could get away with an attack. And while the United States and NATO had plenty of resources to do so, how much of a margin does Israel or Arab states have for retaliation or defense? –And if Iran does attack, well there isn’t much the UN could do about it. By the same token, the UN wouldn’t support a Western assault on Iran. Is it now official that the United States or Great Britain can only do things if the UN approves in advance? Should Israel conclude that its defense by allies is dependent on the UN agreeing that it should not be wiped off the map? Even Straw admits that Russia or China would probably veto any strong action against Iran. If I had more space, I’d dispute the details of Straw’s history of UK-Iran relations but briefly let me note that the historical mistreatment of Germany and Russia were once leading arguments for appeasing those countries at a time when their regimes were Nazi and Communist. Straw could, if he wished, equally make the precise opposite argument that the majority of Iranians would love to have the West help overthrow the Islamist regime. But there is another theme here as well and one that is especially relevant to Iran’s history. The idea is deeply entrenched in Western thinking that if foreigners are seen as very powerful that this creates profound resentment. In fact, it has often been true—and especially so in Iran—that the belief in powerful foreigners makes people want to be on the winning side. Straw blames the emergence of hardliners in Iran on U.S. policy under President George W. Bush. Again, space forbids a detailed discussion of this assertion but it is quite wrong. Straw argued that Iranian president Muhammad Khatami wanted to follow a moderate policy but Washington was not cooperative. It is well-known in Iran that Khatami never had much power to do anything, especially change Iran’s foreign policy into one of working with the United States. At any rate, this plays to another dominant theme in current Western policy: nobody in the Third World is truly radical , ideologically hard-line, or violent unless due to mistreatment by the West. In other words, Iran is only seeking nuclear weapons because it wants to have nuclear power, an idea most experts ridicule. What about all that petroleum the country produces and which can be accessed for almost no cost as compared to a dangerous and politically costly route for power generation? Straw thinks that Iran’s Supreme Leader, Ayatollah Khamenei just “wants to create the intellectual capacity for a nuclear weapons system, but will stop short of making that system a reality.” Then why is Iran paying such a high price for something it doesn’t intend to do? Is it just “a yearning to be treated with respect”? If so, it isn’t working. Then Straw once again shows how bizarre the logic of Western leaders has become: “If I am wrong, further isolation of Iran would follow….” In other words, well if I’m wrong then we could go back to isolating Iran. But isn’t isolating Iran with nuclear weapons a bit different from doing so for an Iran that doesn’t have them? Straw also ends with more silliness: an extended discussion of how Israel’s election proves that Israelis don’t support an attack on Iran. The election had nothing to do with that at all. Indeed, the party that really focused on the idea of a threat did not do well at all. Here’s an article about how Iran was not a campaign issue. Again, I agree with Straw that actually attacking Iran is not a good idea but the article is riddled with remarkably bad assumptions. These include: abandon your own leverage; put a priority on not offending your enemies; believe that the stronger you are the worse the situation is; blame yourselves for the enmity of extremists and fanatics; risk Israel’s existence on your wishful thinking; make your foreign policy dependent on UN decisions; view foreign policy as a means of paying reparations; and totally misunderstand the politics of other countries. Here’s the Los Angeles Times making all the same arguments in a September 2009 editorial. Straw, like other leaders, simply ignore experience in favor of the ideas bouncing around in their heads. But a far better article on the same subject is written by Matthew Gould, the former British ambassador to Iran. He stresses that the main goal of the regime in Tehran is to stay in power. Thus, he believes sanctions can work by making the rulers fear that they might have to choose between nuclear weapons and having the country (and hence the regime) come close to collapse. I don’t know if Gould is right on sanctions but he’s making the correct kind of argument. What Gould understands and Straw doesn’t understand is that having power and leverage is a good thing. The whole guilt-ridden, apology-oriented approach to international relations taken by the Obama Administration and many in Europe (and also generally taught in Western universities) doesn’t work. It only convinces your foes that you are weak and your friends that you are unreliable.